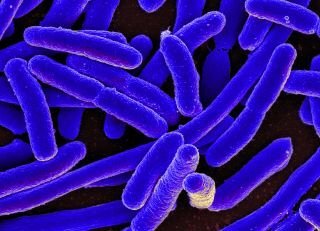 Scanning electron micrograph image of E. coli. Update for Nov. 12: The Cygnus cargo mission carrying this experiment launched on Sunday, Nov. 12. Its planned launch attempt on Nov. 11 was aborted when a wayward aircraft entered the restricted airspace near the launch site. "EcAMSat will investigate spaceflight effects on bacterial antibiotic resistance and its genetic basis," NASA officials said in a statement. "Bacterial antibiotic resistance may pose a danger to astronauts in microgravity, where the immune response is weakened. Scientists believe that the results of this experiment could help design effective countermeasures to protect astronauts' health during long-duration human space missions." The E. coli AntiMicrobial Satellite (EcAMSat) mission will investigate microgravity effects on the antibiotic resistance of E. coli. Here on Earth, this study could help medical researchers better understand how bacteria respond to stress, which may lead to the development of more effective antibiotics, according to the statement. The investigation aims to determine "the lowest dose of antibiotic needed to inhibit growth of Escherichia coli (E. coli), a bacterial pathogen that causes infections in humans and animals," NASA officials wrote in a description of the experiment. Rather than being housed inside the space station, this experiment will take place in a 6U cubesat, a small satellite that has six times the volume of a single cubesat. EcAMSat's satellite weighs about 23 lbs. (10.4 kilograms) and measures 14.4 inches (36.6 centimeters) long, 8.9 inches (22.6 cm) wide and 3.9 inches (9.9 cm) tall. The E. coli AntiMicrobial Satellite (EcAMSat) undergoes testing at NASA Ames Research Center in Mountain View, California. The NanoRacks CubeSat Deployer at the International Space Station will send the bacteria on their way, and the experiment will be conducted autonomously inside the cubesat. Both naturally occurring and mutant strains of E. coli will be exposed to different concentrations of antibiotics. "The overall purpose of this is to challenge these bacteria to different stress levels that will be controlled autonomously through software," Stevan Spremo, the EcAMSat project manager at NASA's Ames Research Center in Silicon Valley, California, said during a teleconference with reporters. Then the bacteria will be stained with a special type of color-changing dye, "which changes from blue to pink when enzymes generated by cellular metabolic processes act upon it," NASA's description reads. In other words, the bacteria that appear pink after being doused in the "viability dye" were resistant enough to survive the antibiotic treatment – specifically, an antibiotic called gentamicin, Spremo said. "Thereafter, we'll look at the trends and be able to decipher what stress response has occurred due to the targeted gene that we're looking at — rpoS — and the absence of it," he added. "If we see the stress response with this gene as an indicator of what's going on with antibiotic resistance, we may be able to increase the effectiveness of antibiotics as well her future use both in spaceflight and on the ground," Spremo said, adding that E. coli is known to be more virulent in space than on Earth. The EcAMSat experiment is a joint effort between NASA's Ames Research Center and the Stanford University School of Medicine.